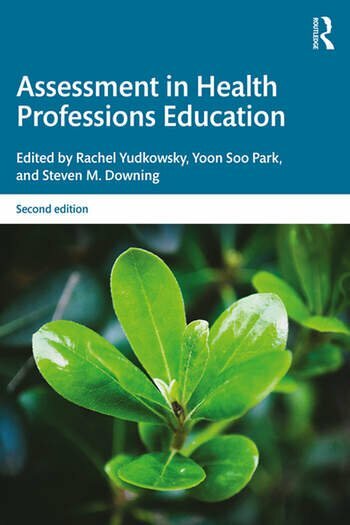 Assessment in Health Professions Education, 2nd Edition, provides a comprehensive guide for educators in the health professions—medicine, dentistry, nursing, pharmacy and allied health fields. This second edition has been extensively revised and updated by leaders in the field. Part I of the book presents an introduction to assessment fundamentals and their theoretical underpinnings from the perspective of the health professions. Part II covers specific assessment methods, with a focus on validity, best practices, challenges, and practical guidelines for the effective implementation of successful assessment programs. Part III addresses special topics and recent innovative approaches, including narrative assessment, situational judgment tests, programmatic assessment, mastery learning settings, and the Key Features approach. This accessible text addresses the essential concepts for the health professions educator and provides the background needed to understand, interpret, develop, and effectively implement assessment methods. Rachel Yudkowsky, MD, MHPE, is Professor and Interim Director of Graduate Studies in the Department of Medical Education in the College of Medicine at the University of Illinois at Chicago, USA, and past Director of the UIC Dr. Allan L. and Mary L. Graham Clinical Performance Center. Yoon Soo Park, PhD, is Associate Professor and Associate Head of the Department of Medical Education, and Director of Research, Office of Educational Affairs in the College of Medicine at the University of Illinois at Chicago, USA. Steven M. Downing, PhD, is Associate Professor, emeritus, in the Department of Medical Education in the College of Medicine at the University of Illinois at Chicago, USA.